Director of Secondary Education, Assam. 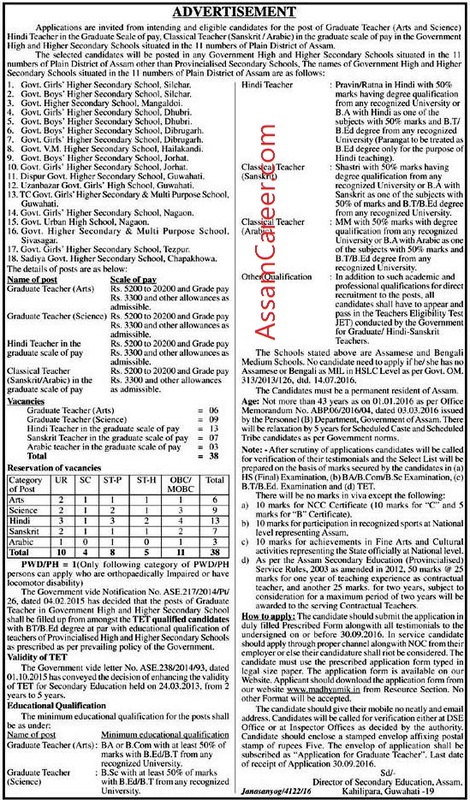 Applications are invited from intending and eligible candidates for the post of Graduate Teacher (Arts and Science) Hindi Teacher in the Graduate Scale of pay, Classical Teacher (Sanskrit/Arabic) in the graduate scale of pay in the Government High and Higher Secondary Schools situated in the 11 numbers of Plain District of Assam. 1. Govt. Girls’ Higher Secondary School, Silchar. 3. Govt. Higher Secondary School, Mangaldoi. 5. Govt. Boys’ Higher Secondary School, Dhubri. 6. Govt. Boys’ Higher Secondary School, Dibrugarh. 7. Govt. Girls’ Higher Secondary School, Dibrugarh. 8. Govt. V.M. Higher Secondary School, Hailakandi. 9. Govt. Boys’ Higher Secondary School, Jorhat. 10. Govt. Girls’ Higher Secondary School, Jorhat. 11. Dispur Govt, Higher Secondary School, Guwahati. 12. Uzanbazar Govt. Girls’ High School, Guwahati. 13. TC Govt. Girls’ Higher Secondary & Multi Purpose School, Guwahati. 14. Govt. Girls’ Higher Secondary School, Nagaon. 15. Govt. Urban High School, Nagaon. 16. Govt. Higher Secondary & Multi Purpose School, Sivasagar. 17. Govt. Girls’ Higher Secondary School, Tezpur. 18. Sadiya Govt. Higher Secondary School, Chapakhowa. 1. Graduate Teacher (Arts) : BA or B.Com with at least 50% of marks with B.Ed/B.T from any recognized University. 2. Graduate Teacher: B.Sc with at least 50% of marks with B.Ed (Science) B.T from any recognized University. 3. Hindi Teacher : Pravin/Ratna in Hindi with 50% marks having degree qualification from any recognized University or B.A with Hindi as one of the subjects with 50% marks and B.T/B.Ed degree from any recognized University (Parangat to be treated as B.Ed degree only for the purpose of Hindi teaching). 4. Classical Teacher (Sanskrit): Shastri with 50% marks having degree qualification from any recognized University or B.A with Sanskrit as one of the subjects with 50% of marks and B.T/B.Ed degree from any recognized University. 5. Classical Teacher (Arabic): MM with 50% marks with degree qualification from any recognized University or B.A with Arabic as one of the subjects with 50% marks and B.T/B.Ed degree from any recognized University. Other Qualification: In addition to such academic and professional qualifications for direct recruitment to the posts all candidates shall have to appear and pass in the Teachers Eligibility Test (TET) conducted by the Government for Graduate/ Hindi-Sanskrit Teachers. 1. Graduate Teacher (Arts) : Rs. 5200 to 20200 and Grade pay Rs. 3300 and other allowances as admissible. 2. Graduate Teacher (Science) : Rs. 5200 to 20200 and Grade pay Rs. 3300 and other allowances as admissible. 3. Hindi Teacher in the graduate: Rs. 5200 to 20200 and Grade pay Rs. 3300 and other allowances as admissible. 4. Classical Teacher (Sanskrit/Arabic): Rs. 5200 to 20200 and Grade pay Rs. 3300 and other allowances as admissible. Age: Not more than 43 years as on 01.01.2016 as per Office Memorandum No. ABP.06/2016/04, dated 03.03.2016 issued by the Personnel (B) Department, Government of Assam. There will be relaxation by 5 years for Scheduled Caste and Scheduled Tribe candidates as per Government norms. How to Apply: The candidate should submit the application in duly filled Prescribed Form alongwith all testimonials to the undersigned on or before 30.09.2016. In service candidate should apply through proper channel alongwith NOC from their employer or else their candidature shall not be considered. The candidate must use the prescribed application form typed in legal size paper. The application form is available on our Website. Applicant should. download the application form from our website www.madhyamik.in from Resource Section. No other Format will be accepted. The candidate should give their mobile no neatly and email address. Candidates will be called for verification either at DSE Office or at Inspector Offices as decided by the authority. Candidate should enclose a stamped envelop affixing postal stamp of rupees Five. The envelope of application shall be subscribed as “Application for Graduate Teacher”. NB: The Schools stated above are Assamese and Bengali Medium Schools. No candidate need to apply if he/ she has no Assamese or Bengali as MIL in HSLC Level as per Govt. OM. 313/2013/ 126, dtd. 14.07.2016. The Candidates must be a permanent resident of Assam.